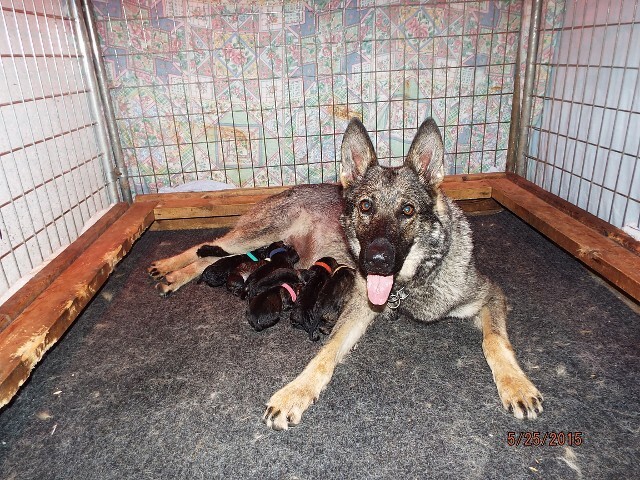 We imported Ebigeill z Get-Pet ZV1, as a pregnant female who was bred to Aron Wind Wild IPO3; She arrived in the U.S.A. on April 10, 2015 and whelped a healthy litter of 9 puppies on May 25, 2015. These puppies all have deposits on them. Ebigeill z Get Pet, ZV1 was bred in Slovakia to Aron Wind Wild, IPO3. Click each dog's name to see a video of that dog working. As of June 22, 2015, there are two male puppies (pick of the litter male, and the 4th male puppy), whom we invite you to place a deposit on. Here is a video of them at 4 and a half weeks old. Taken the morning of July 21, when they are nearly 7 weeks old. Lots of puppy play! Watch for a 7 or more puppy tug of war over a hand towel. Too cute.